AvaHost Review 2019: Is AvaHost a Good Hosting? AvaHost has been in operation for over 15 years. The company started out offering services to the English-language market, but has since expanded its services to cater to the Russian-speaking segment. AvaHost was founded in 2001. The company started out offering services to the English-language market, but has since expanded its services to cater to the Russian-speaking CIS countries. It has data centers located in the U.S., Europe, and Russia and accommodates a global customer base. The AvaHost.ua website is in Russian; however, it has a sister website, AvaHost.net, to offer its services and support in English. AvaHost offers a range of shared, WordPress, reseller, and VPS hosting services. All plans come with MySQL and PHP support along with a CMS of your choice: 1C-Bitrix, Joomla, Drupal, and WordPress among others. The best thing about being hosted by AvaHost is that you get to choose the data center where you want your website to be hosted from: the company has data centers in Ukraine, Russia, the United Kingdom, or the United States. AvaHost gives you a complete and ready-to-use platform once you create your hosting account. The company offers a user-friendly website builder that’ll allow even an amateur webmaster to create a decent website. 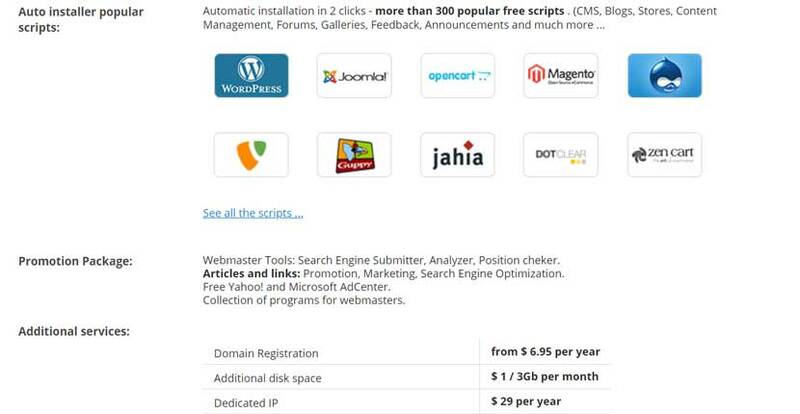 Accounts are powered by a cPanel installation and include pre-installed modules for search engine optimization and a wide variety of templates. You can purchase a dedicated IP address at an additional cost, along with extra storage space, add-on domains, and domain name registrations. AvaHost’s shared hosting packages are very competitively priced, especially considering that you get a minimum of 20GB storage and unlimited bandwidth. You’ll also get a free one-year domain registration even with the entry-level plan. AvaHost even offers a 60-day money-back guarantee, demonstrating its confidence in its services. The company also frequently runs promotional offers; you can get up to a 30% discount during these promotional periods. Another perk you’ll find with AvaHost is that you may be eligible for three months of hosting — provided you’re transferring your website over from another provider or renewing your hosting plan after your website has been on hiatus for more than three months. The caveat is that you’ll have to opt for a plan of at least half a year, and you have to contact support to submit your request within 15 days of your account activation. Available billing cycles include 1, 3, 6, 12 and 24-month contracts. 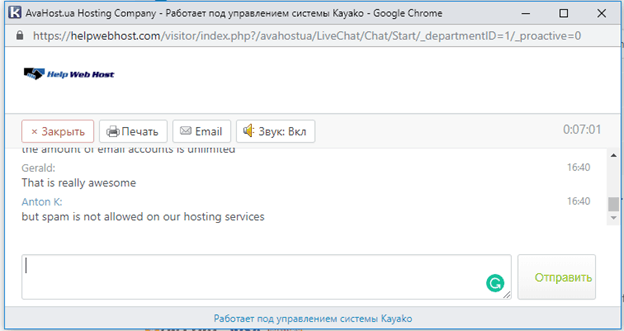 AvaHost accepts payments through PayPal, WebMoney WMZ, credit cards, and Yandex.Money. AvaHost maintains a great knowledge base. Here, you’ll find video tutorials, explanations of key terms, and articles that should answer many of your questions. The company also offers 24/7 support and can be reached through email, a ticket system, telephone, or live chat. I connected with them via live chat and found that they’re very quick to respond: I never had to wait more than three minutes to get a response from support staff. AvaHost is a reliable and cost-effective web hosting provider. While I’m not a fan of the lower-than-average uptime guarantee, the resources and features offered with AvaHost’s plans make up for this. Wondering how AvaHost stacks up against other Web Hosting companies? Enter any other Web Hosting company and we will give you a side-by-side comparison.